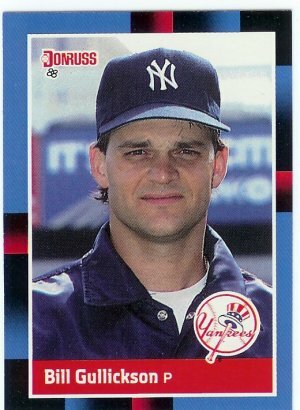 I remember when the Yankees acquired today’s Pinstripe Birthday Celebrant in a straight-up one for one trade with Cincinnati for pitcher Dennis Rasmussen late in the 1987 season. I liked the deal even though Gullickson was a right handed pitcher coming to Yankee Stadium and Rasmussen was a southpaw, leaving it. Those of you who can remember when Gullickson started for the Expos in the early eighties might recall that he was a very good pitcher for Montreal. During his six full seasons with the team he had won 72 games (still good for fourth best on the franchise’s all-time wins list.) He then got traded to the Reds after the ’85 season and he went 15-12 during his one full season there. Gullickson was a big guy, six foot three inches tall but he didn’t throw hard. Instead he depended on pinpoint control, walking an average of just two hitters per nine innings. 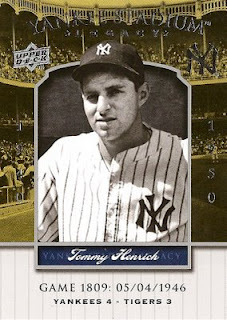 He gave up quite a few home runs when he pitched but they usually occurred in non-crucial situations, which helps explain why his ERA as an Expo had been just 3.44. A lot of Yankee fans hated seeing Rasmussen go because as mentioned before, he was a lefty, he had gone 18-6 for New York in 1986, and had a winning record (9-7) at the time the deal was made. At the same time, Gullickson was 10-11 for the Reds and his ERA was a tenth of a point higher than Rasmussen’s even though he had the advantage of pitching to lineups that included pitchers instead of DH’s. Both pitchers were 28-years-old and both were on cold streaks. Rasmussen had lost his last three starts as a Yankee and Gullickson had dropped five straight decisions. Despite all that, I thought Gullickson was the better pitcher of the two and the future proved me correct. In 1991 he led all AL starters with 20 wins. The problem was he got those wins for the Tigers and not the Yankees. Gullickson would end up pitching just one month in pinstripes, going 4-2 in September of 1987. That was his option year. That also happened to be the same year big league owners allegedly colluded and agreed they would no longer bid for other team’s free agents. 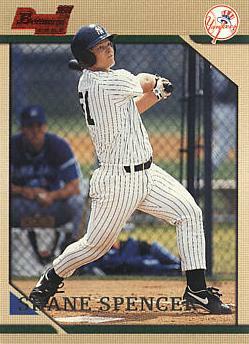 Rather than sign again with the Yankees, Gullickson decided to play in Japan for the next three years. In 1990, he returned to the MLB and pitched for the Astros. 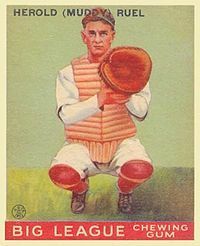 The following year he signed with the Tigers and put together his career year. 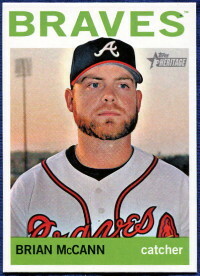 He would retire after the 1994 season with a 14-year big league record of 162-136 and a career ERA of 3.93. He also pitched his entire career with diabetes. Sharing Gullickson’s February 20th birthday is this outfielder who swung at one of the most famous third strikes in Yankee history, this other outfielder who’s overthrow of a cutoff man turned into one of the most famous plays in Yankee history, this brand new Yankee catcher and this former Yankee catcher.